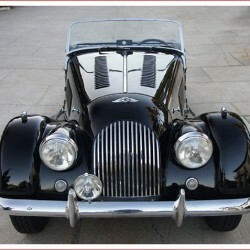 I spotted this Morgan Plus 4 sports car for sale on eBay – what a pity it’s in the USA. Never-the-less, it’s always great to see some photos of those wonderful flowing lines once again. Of all the classic British post-war roadsters produced, no other car is quite as unique or charming as the Morgan Plus 4. With a simple and strong drive train, agile handling and a truly visceral, sporting drive quality, sitting behind the wheel a well-sorted Morgan is ceaselessly grin-inducing. Timeless and distinctive styling never fails to garner appreciation, part of the reason these iconoclastic cars are perennial favorites at shows and touring events. Produced between 1950 and 1969, the Plus 4 was a larger, quicker version of the company’s popular 4/4 model. The early 1960s models are really the most representative of the breed and better to drive with the significant benefit of the Triumph sourced inline four-cylinder engine. This example is fitted with the desirable 2138cc TR4 motor and Moss 4-speed gearbox and it is an absolute joy to drive. The car starts easily, idles consistently and pulls strongly and smoothly through each of the gears. The transmission is crisp and smooth, the suspension is stiff and the car drives and brakes straight. The best way to describe the car would be that it’s completely tight, needing nothing to be enjoyed. The rare, correct black paint is in excellent condition, marred only by the most minor of imperfections, none of which appear in any of the pictures. All of the brightwork is flawless, all of the glass and rubber is excellent and the original wheels are in great shape, wrapped in tires with plenty of remaining tread. The undercarriage is clean and rust-free and all of the ash wood is perfect. The leather seats show only the most minimal wear, the carpets are excellent and the dash wood has been nicely refinished. The car comes with its original soft top, a brand new soft top, a boot cover and its original side curtains. Everything works as it should, including all of the gauges and the car’s rare optional upgraded Lucas headlamps and bumper mounted driving light. Here’s the link to the eBay advertisement for the Morgan Plus 4.